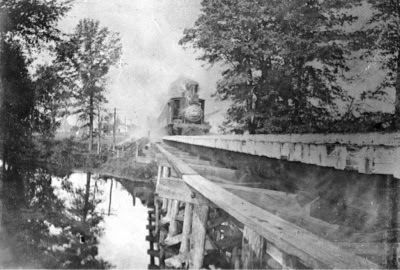 I think the subject photo shows a train on what would become the Berlin Branch. If so, it's a "Valley Line" shot to the extent that this line was regularly serviced by the Valley Local during my era. In fact, it could also be an "Air Line" shot since the Air Line local would occasionally make the trip up to East Berlin too. That's a pretty interesting trestle if nothing else. So much for the "few words" - now for the "few questions:"
First off - can anybody tell for sure if this is the Berlin line? Any idea of the era? Or location?